This is a great product for .Net Micro framework developers. GHI also provides a complete and free project ebook for the kit. Already own a FEZ Panda or FEZ Domino? Or want to use the internet with Arduino or its derivatives? Consider the FEZ Internet of Things Kit. 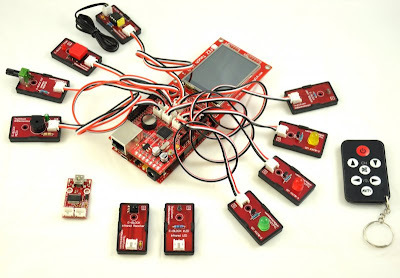 This unique kit provides internet connectivity to FEZ processor boards. 2.4 inch color touch screen display with 240x320 resolution. Go wireless with the same Ethernet port with this easy to configure Ethernet to WiFi Wireless bridge. Simple sensors for your next project with open source drivers. Shields allow you to expand your hardware to create cool projects.